Test Driven Development (TDD) is an iterative development cycle that emphasizes writing automated tests before writing the actual code. Write just enough code to make those tests pass. With TDD, you’ll learn to break code up into logical, easily understandable pieces, helping ensure the correctness of code. Recognize when code breaks occur. TDD helps address these issues. It in no way guarantees that your code will be error free; however, you will write better code, which results in a better understanding of the code. This in itself will help with eliminating errors and at the very least, you will be able to address errors much easier. TDD is practically an industry standard as well. Enough talk. Let’s get to the code. For this tutorial, we’ll be creating an app to store user contacts. Please note: This tutorial assumes you are running a Unix-based environment - e.g, Mac OSX, straight Linux, or Linux VM through Windows. I will also be using Sublime 2 as my text editor. Also, make sure you you’ve completed the official Django tutorial and have a basic understanding of the Python language. Also, in this first post, we will not yet get into some of the new tools available in Django 1.6. This post sets the foundation for subsequent posts that deal with different forms of testing. Before we do anything we need to first setup a test. For this test we just want to make that Django is properly setup. We’re going to be using a functional test for this - which we’ll be explained further down. Congrats! You wrote your first failing test. Now let’s write just enough code to make it pass, which simply amounts to setting up a Django development environment. You should see the FireFox window navigate to http://localhost:8000/ again. This time there should be no errors. Nice. You just passed your first test! Now, let’s finish setting up our dev environment. With the project setup, let’s take a step back and discuss functional tests. We approached the first test through Selenium via Functional tests. Such tests let us drive the web browser as if we were the end user, to see how the application actually functions. Since these tests follow the behavior of the end user - also called a User Story - it involves the testing of a number of features, rather than just a single function - which is more appropriate for Unit tests. It’s important to note that when testing code you have not written, you should begin with functional tests. Since we are essentially testing Django code, functional tests are the right way to go. Another way to think about functional vs unit tests is that Functional tests focus on testing the app from the outside, from the user’s perspective, while unit tests focus on the app from the inside, from the developer’s perspective. This will make much more sense in practice. Before moving on, let’s restructure our testing environment to make testing easier. Before moving on, let’s see what’s going on here. If all went well it should pass. You should also see FireFox open and go through the process we indicated in the test with the setUp() and tearDown() functions. The test itself is simply testing whether the “/admin” (self.browser.get(self.live_server_url + '/admin/') page can be found and that the words “Django administration” are present in the body tag. Correct the test. Test it again. Commit the code. Finally, did you notice that we started the function name for the actual test began with test_. This is so that the Django test runner can find the test. In other words, any function that begins with test_ will be treated as a test by the test runner. Next, let’s test to make sure the user can login to the admin site. This failed because we don’t have an admin user setup. This is an expected failure, which is good. In other words, we knew it would fail - which makes it much easier to fix. Test again. It should fail again. Why? Django creates a copy of our database when tests are ran so that way tests do not affect the production database. Run the test. It should pass. Each time a test is ran, Django dumps the test database. Then all the Fixtures specified in the “test.py” file are loaded into the database. Run it again. Make sure it passes. Refactor the test if needed. Now think about what else you could test. Perhaps you could test to make sure the admin user can add a user in the Admin panel. Or perhaps a test to ensure that someone without admin access cannot access the Admin panel. Write a few more tests. Update your code. Test again. Refactor if necessary. Next, we’re going to add the app for adding contacts. Don’t forget to commit! Now, write just enough code for this to pass. That’s it for the admin functionality. Let’s switch gears and focus on the application, user_contacts, itself. Did you forget to commit? If so, do it now. Think about the features we have written thus far. We’ve just defined our model and allowed admins to alter the model. Based on that, and the overall goal of our Project, focus on the remaining user functionalities. Try to formulate the remaining Functional test(s) based on those requirements. Before we write the functional tests, though, we should define the behavior of the code through unit tests - which will help you write good, clean code, making it easier to write the Functional tests. Remember: Functional tests are the ultimate indicator of whether your Project works or not, while Unit tests are the means to help you reach that end. This will all make sense soon. Let’s pause for a minute and talk about some conventions. Although the basics of TDD (or ends) - test, code, refactor - are universal, many developers approach the means differently. For example, I like to write my unit tests first, to ensure that my code works at a granular level, then write the functional tests. Others write functional tests first, watch them fail, then write unit tests, watch them fail, then write code to first satisfy the unit tests, which should ultimately satisfy the functional tests. There’s no right or wrong answer here. Do what feels most comfortable - but continue to test first, then write code, and finally refactor. First, check to make sure all the views are setup correctly. Name this test test_views.py and save it in the user_contacts/tests directory. Also add an __init__.py file to the directory and delete the “tests.py” file in the main user_contacts directory. It should fail - AssertionError: 404 != 200 - because the URL, View, and the Template do not exist. If you’re unfamiliar with how Django handles the MVC architecture, please read the short article here. The test is simple. We first GET the url “/” using the Client, which is part of Django’s TestCase. The response is stored, then we check to make sure the returned status code is equal to 200. Run the test again. It should pass just fine. The test for this view is nearly identical to our last test. Try it on your own before looking at my answer. When ran, you should see the same error: AssertionError: 404 != 200. This should pass as well. This test is slightly different from the previous two, so please follow along closely. Does it pass? It should. If not, refactor. Now that we’re done testing the Views, let’s add validation to the form. But first we need to write a test. Surprise! In other words, we are testing the logic in a validation file that does not exist yet. What needs to be done in order to get this test to pass? Well, we first need to add a function to the views for adding data to the database. This time only one test should fail - AssertionError: 302 != 200 - because we tried to add data that should not have passed the validators but did. In other words, we need to update the “models.py” file as well as the form to take those validators into account. Setup an admin user again. Run the tests again. 7 should pass. Run the test suite. All 9 tests should now pass. Yay! Now commit. With the Unit tests done, we can now add a Functional test to ensure that the app runs correctly. Hopefully, with the Unit tests passing, we should have no problems with the Functional test. Here we’re just testing the code we wrote and already tested with Unit tests from the end user’s perspective. All four tests should pass. Run it. Five tests should pass. Commit and let’s call it a day. TDD is a powerful tool and an integral part of the development cycle, helping developers break programs into small, readable portions. Such portions are much easier to write now and change later. Further, having a comprehensive test suite, covering every feature of your codebase, helps ensure that new feature implementations will not break existing code. Within the process, Functional tests are high-level tests, focused on the features that the end users interact with. Meanwhile, Unit tests support Functional tests in that they test each feature of the code. Keep in mind that Unit tests are much easier to write, generally provide better coverage, and are easier to debug because they test only one feature at a time. They also run much quicker, so be sure to test your unit tests more often than your functional tests. Congrats. You make it through. What’s next? First, you may have noticed that I did not 100% follow the TDD process. That’s okay. Most developers engaged in TDD don’t always adhere to it in every single situation. There are times that you must deviate from it in order to just get things done - which is perfectly fine. 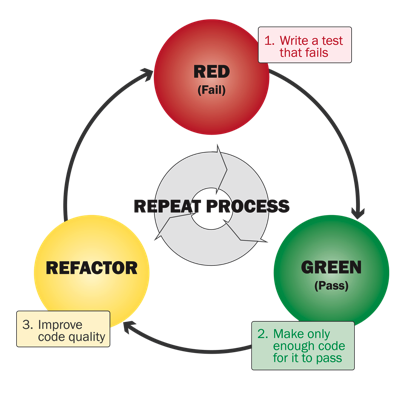 If you’d like to refactor some of the code/process to fully adhere to the TDD process, you can. In fact, it may be a good practice. Second, think about the tests I missed. Determining what and when to test is difficult. It takes time and much practice to get good at testing in general. I’ve left many blanks that I intend to revel in my next post. See if you can find those and add tests. Finally, remember the last step in the TDD process? Refactoring. This step is vital as it helps create readable, maintainable code that you not only understand now - but in the future as well. When you look back at your code, think about tests you can combine. Also, which tests should you add to ensure that all written code is tested? You could test for null values and/or server side authentication, for example. You should refactor your code before moving on to writing any new code - which I did not do for time’s sake. Perhaps another blog post? Think about how bad code can pollute the entire process? Thanks for reading. Grab the final code in the repo here. Please comment below with any questions.